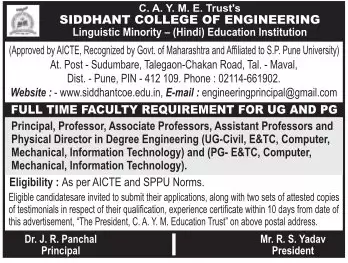 Siddhant College of Engineering, Pune, Maharashtra Advertised in Loksatta epaper for the faculty recruitment 2019 – Professor Jobs, Associate Professor Jobs ,Assistant Professor Jobs. For More Details see below. About Institution : Siddhant College of Engineering, established in the year 2005 with a vision to provide high-quality professional education. The college is approved by All India Council for Technical Education, New Delhi, recognized by State Government of Maharashtra and affiliated to university of Pune.